Courtesy photo SBossier City Chief of Fire Prevention Jerry Nuckolls presents the fire department's appreciation award to Anna Grace Plummer. The Bossier City Fire Department has honored a south Bossier City girl for helping preventing a neighbor’s home from catching fire. Anna Grace Plummer, seven, is the recipient of the Bossier City Fire Department’s Appreciation Award for her actions on June 19, after she spotted a trash can on fire inside the garage of a neighbor’s home in the 5600 block of Bayou Drive. Upon seeing the fire Anna Grace immediately told her mother about it who in turn contacted the neighbor. The neighbor was able to put the out the fire with water from a garden hose. As a result of Anna Grace’s quick action, her neighbor’s home was spared from being damaged by fire. 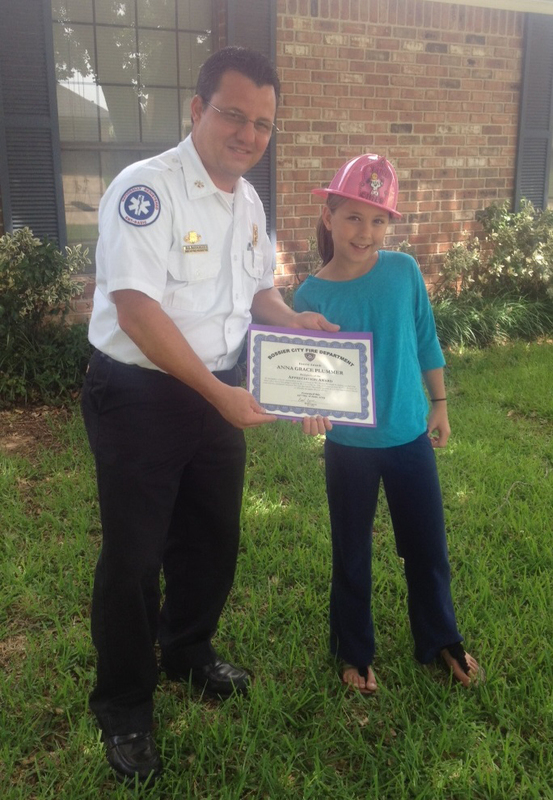 Chief of Fire Prevention Jerry Nuckolls presented Anna Grace with her award at her home this week.